I’ve said this before, and I’m sure you’ll forgive me for saying it again: Kilmartin Glen is an absolute joy. I’ve already written about the standing stones at Ballymeanoch and Nether Largie, the burial cairn at Dunchraigaig and the wonderful rock carvings at Achnabreck. My last post was about the stone circles at Temple Wood, and my next port of call is just a couple of hundred yards away, a pleasant walk up a farm track with woods and fields on either side. This is a burial chamber called Nether Largie South, purely to distinguish it from Nether Largie North and Nether Largie Mid. 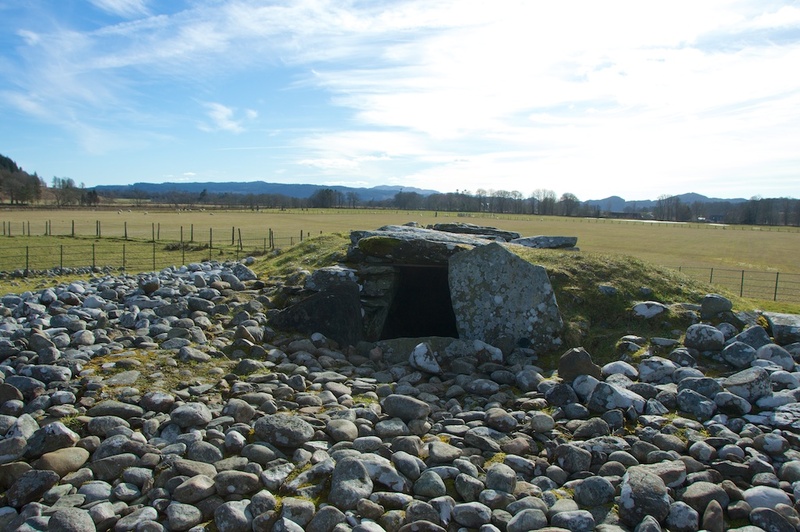 If you get the impression that Kilmartin is pitted with ancient burials, you’re not far wrong. And, as ancient burials go, Nether Largie South is one of the oldest. In its earliest form, it is thought to date from between 3600 and 3500 BC, placing it well within the Neolithic period. 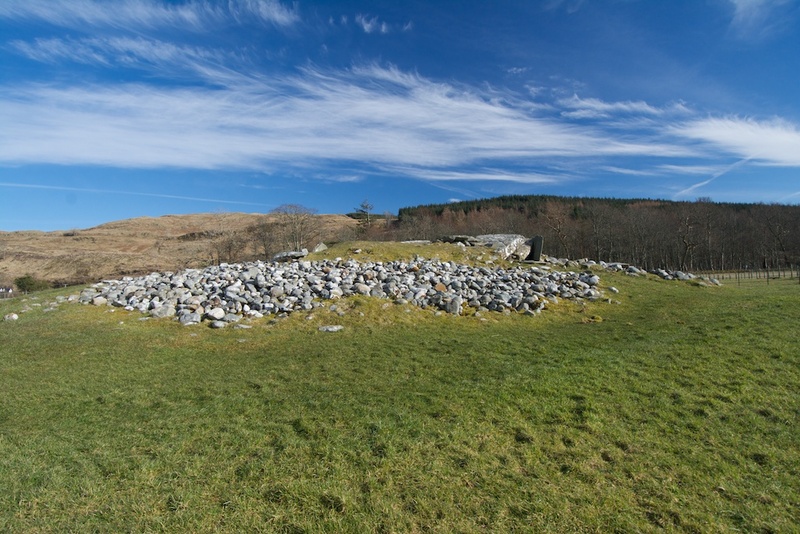 This makes it one of the first structures known to have been built in Kilmartin Glen. How do we know its age? Partly from the pottery vessels that were discovered there, together with fragments of human bone – some of which had been cremated – along with arrowheads, flint tools, a bovine tooth, and fragments of quartz pebbles. 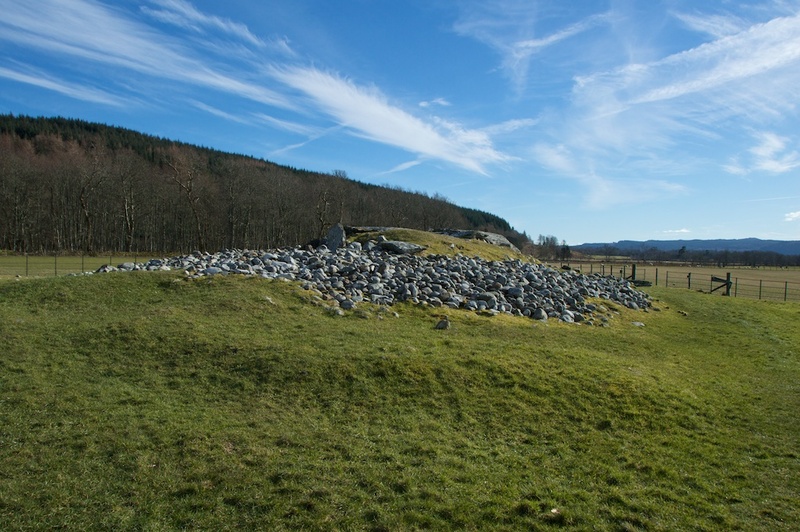 About a thousand years after it was first built, the cairn was enlarged and the stone covering was widened to around 32 yards across, probably to include two smaller, secondary cists or burial chambers which had been added around the perimeter. It’s impossible to know just how often, and in what way, the place was used in the intervening period of a thousand years: to us today, looking at everything ‘prehistoric’ from the same viewpoint, it’s hard to distinguish two eras that were, in fact, as far apart chronologically as Queen Elizabeth II and William the Conqueror. Which rather makes you wonder if the newcomers had to apply for the Bronze Age version of Listed Building Consent. One of the secondary cists has since been lost; this is the only surviving one. 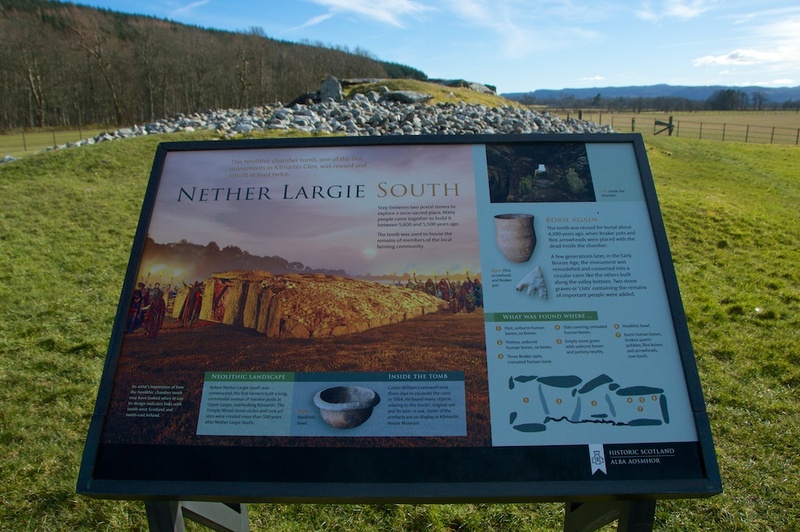 Nether Largie South is one in a chain of five burial cairns that extend in a line, down the length of Kilmartin Glen. It’s believed that there may, originally, have been at least one more. The others all appear to date from the Bronze Age, “at a time when powerful leaders were keen to emphasise their status.” (Kilmartin Museum) This linear cemetery is the only example of its kind in Britain. In the other cairns, finds include parts of a jet necklace and richly decorated food vessels that speak of wealth and power. In 1864 Nether Largie attracted the interest of archaeologist William Greenwell, a canon of Durham Cathedral and a Fellow of the Society of Antiquaries of Scotland. Greenwell made detailed records of his finds, and took measurements of the chamber including its supporting stones and roof lintels. In his report of 1865, he noted that large quantities of the covering stones had been taken away over the centuries, and used for building nearby walls and drains. 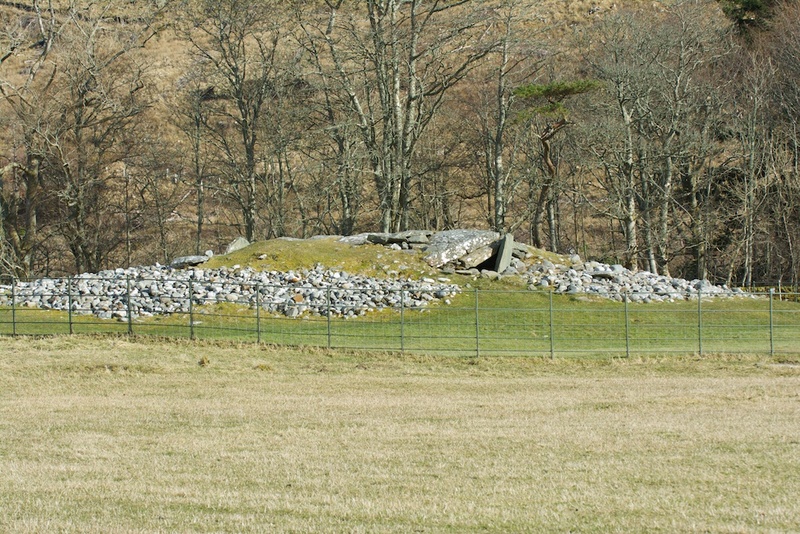 An information sign gives a beautiful illustration of the cairn as it might once have appeared, with the full moon setting in the west and bands of warriors carrying torches, perhaps in a ceremony to honour the dead. The entrance faces north-east, and from the picture it is easy to see the original shape, sloping back in an elegant curve towards the south-west, capped with cobbles which were held in place by small kerb stones. What an impressive sight. If you stepped between those two entrance stones, it must have felt as if you were entering the underworld. Over five thousand years later, you can almost catch a whisper of that experience, although the outward appearance of the cairn is nowhere near as impressive. 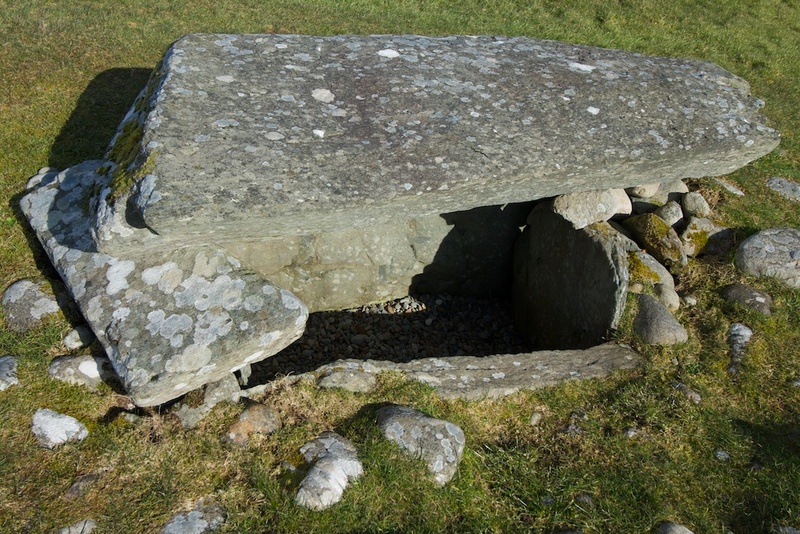 Two upright stones flank the portal to the chamber, and the roof is capped by several massive slabs, upon which moss and lichen have inscribed their own cryptic messages. As you step down into the interior, you’re aware of the contrast of darkness and light – the damp, deep stillness of cold stone, and shafts of sunlight striking bold angles on the gravel floor, highlighting rough walls and lintels, beaming life into a corpse. And there is life here… tiny green leaves, spotlit by the rays, soaking up the abundance before the cosmic dance of Sun and Earth casts them back into darkness. In the stone womb of this place, you’re more conscious of your other senses – sound and smell – although you find your eyes rapidly adjusting to take in every nuance of shadow. You feel as if you could hear the rhythm of the Earth’s movement, if you stayed here long enough. I’d quite like to know how animals behave around it – whether they shelter inside, or avoid it. As for myself, it felt distant and gentle, but not for me, not for the living. I didn’t spend long in there. I’m always a bit hesitant about going inside places that were once used as tombs for the dead. Part of me wishes that they had never been excavated, and that the precious finds – sparse and broken as they are – had never been removed. How can you preserve the spirit of a place if you take away the things that lie at its heart? Do the souls still stay there, and do they mind? I know, of course, that this is just idealism, and I force myself to be practical. We would know nothing about these places, after all, if they hadn’t been excavated, and their treasures carefully measured, recorded and preserved. We wouldn’t be able to go into them at all, if they hadn’t been opened up for public viewing. At least, in Kilmartin, you have a sense of a balance being maintained; it never seems to be overrun with visitors, and it’s nice to think that, on cold wet days, when the drizzle closes in, there’s no one there to disturb the silence. If you’re interested in optical phenomena, you might like this gallery of ‘orbs’ which found their way into Colin’s camera. No orbs for me, I’m afraid, although I am standing directly behind a cluster of them (in the second photo). Whatever their origin, I love their colour! Kilmartin lies about 20 miles south of Oban in Argyll. 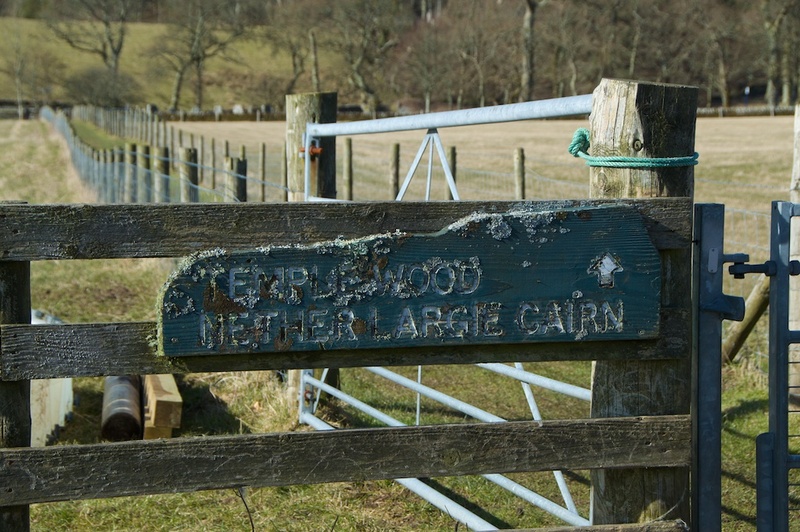 You can walk to all the cairns from the car park off the B8025, which runs parallel to the Kilmartin Burn. Go west through the field, past the Nether Largie standing stones, towards the Temple Wood stone circles; from there, follow the track northwards to Nether Largie South cairn, and then carry on (if you like) towards the other cairns in the row. Seriously, I should warn you that a short walk could take a very long time! Great post Jo. Mind you Kilmartin Glen won’t be the relatively quiet, unspoilt place it is if you tell too many people about it. It looks a tad spooky in that chamber. I’m not sure how I’d have felt about going inside, but well done for braving it and taking pictures to prove it. Lovely wispy clouds, too. Would you ever go inside a pyramid? I like the idea of seeing inside one but I’m afraid I’d get claustrophobic. I thought it might be spooky, Lorna, but actually it was not too bad, because you can see daylight through both sides. But no, I wouldn’t go inside a pyramid – I have thought that many times. No matter how fascinating the hieroglyphics! I’m with you on that one. Lovely photos, Jo. Kilmartin Glen is an amazing place. Thanks, Aileen! Yes, Kilmartin is one of our favourite places.